67 years ago (October 29, 1947) 10,000 people crowded into the site labeled as the Midtown Shopping Center. Today, generally, we call the area Wards Corner – as many called it before the Midtown Shopping Center was constructed – and continued to call it after. Those on hand that evening witnessed the formal opening of the Shopping Center which was arranged by the developers, owners and operators of the 20-odd retail outlets there. The Principal speakers for the opening were Lt. Gov. L. Preston Collins, and the Norfolk City Manager C.A. Harrell. A second night of celebrations was scheduled for the 30th with an even larger crowd expected. Photos by Virginian-Pilot photographer Charles Borjes c/o The Sargeant Memorial Collection. On November 4, Norfolk voters will decide whether or not our city’s School Board will be elected. Do you know all of the potential pros and cons of elected and appointed school boards? When and how would Norfolk School Board members be elected? How have other localities experienced the transition from appointed to elected school boards? The discussion will be facilitated by Vivian Paige. Denby Park properties to be purchased by City of Norfolk. 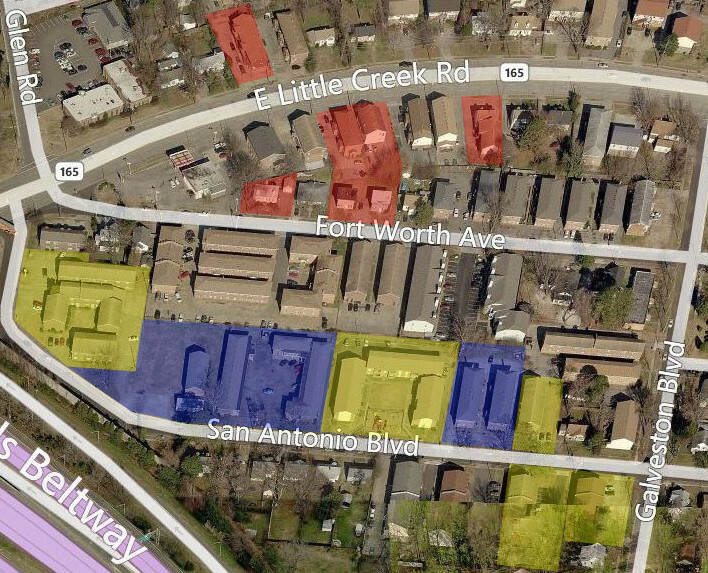 YELLOW highlighted properties are to be purchased in 2014. RED highlighted properties were purchased in 2013. BLUE highlighted properties were purchased in 2011. The Texas streets portion of Denby Park has, in the past, been referred to as the criminal cancer of Wards Corner. The City of Norfolk is completing steps to finalize its third purchase of property in that area in an attempt to rid it of the substandard housing that attracts the criminal element. The most recent purchase includes 88 units on San Antonio Blvd. The addresses are: 352 San Antonio, 366 San Antonio, 369 San Antonio, 375 San Antonio, 7816, 7820, 7824 San Antonion, and 7812 San Antonio. The city’s Department of Neighborhood Development is inviting the public to attend a community celebration on October 21, 2014 at 4:00 PM at 352 San Antonio Boulevard to celebrate the purchase and eventual demolition of the 88 additional units in Denby Park. Expect brief remarks made by elected officials and members of the community. Police/Fire-Rescue will be on hand cooking and serving food and refreshments so bring your appetite. The next meeting of the Greater Wards Corner Area Business Association will be held Tuesday, October 21st at FARM FRESH, 230 E Little Creek Road. Doors will be open at 8:00a.m. It will begin promptly at 8:30 an end at 9:30a.m. and take place upstairs. Since a light breakfast will be served, it is requested that you, RSVP, gwcaba@cox.net or call and leave message at 757-587-7975 by October 13th. You are currently browsing the Wards Corner Now - Wards Corner, Norfolk, Virginia blog archives for October, 2014.